Critically acclaimed TV trio, Rob Brydon, Lee Mack & David Mitchell will tour the UK for the first time in 2019. 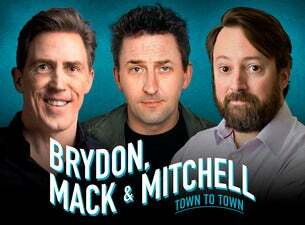 Brydon, Mack & Mitchell – Town To Town will see the much-loved comedians and master-raconteurs play selected theatres around the UK, with dates in Sheffield, Portsmouth, Swansea, Cardiff, Southend and Brighton. Join Rob, Lee and David for an unmissable evening of chat, comedy and general messing around.